Composition in Black No.127, 1984. Acrylic on canvas, 88 x 43 in. "Champagne", 1990. Acrylic on canvas, 88 x 64 in. "Sentinel's Watch", 1990. Acrylic on canvas, 90 x 64 in. "Uxmal", 1990. Acrylic on canvas, 58 x 42 in. "Sans Titre", 1991 Acrylic on canvas, 96 x 72 in. 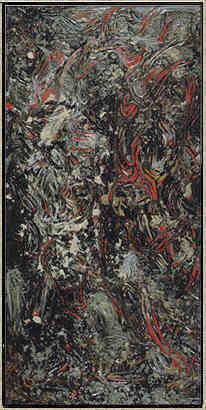 "Aztec Sea", 1992. Acrylic on canvas, 96 x 72 in. "Bronze Drama", 1992. Acrylic on canvas, 96 x 72 in. "Sun's Relief", 1992. Acrylic on canvas, 70 x 93 in. "Prairie Fire", 1993. Acrylic on canvas, 72 x 96.5 in. "Angel's Rest", 1995. Acrylic on canvas, 96 x 72 in. "Lascaux", 1995. Acrylic on canvas, 96 x 72 in. "Capetown Memory Blues", 1996. Acrylic on canvas, 58 x 48 in. "Golden Rain", 1996. Acrylic and copper slag on canvas, 68 x 46.5 in. "Ancestral Blues", 1997. Acrylic on canvas, 37 x 117 in. "Galleon Storm", 1992-98. Acrylic on canvas, 96 x 72 in. "Up from the Deep", 1998. Acrylic on canvas, 53 x 102.5 in. "Untitled", 1999. Acrylic on canvas, 66.5 x 93 in. "Frost Line", 2002. Acrylic on canvas, 39.5 x 29 in. "Silver Wisdom", 2002. Acrylic on canvas, 225.5 x 90 in. "Horizontal Blue", 2005. Acrylic on canvas, 26 x 42 in. "Instinct", 2005. Acrylic on canvas, 52 x 40.5 in. "Morning Rise", 2005. Acrylic on canvas, 44 x 68 in. "Night of the Eclipse", 2005. Acrylic on canvas, 55 x 37 in. "Night Heat", 2005. Acrylic on canvas, 41 x 56 in. "Passage", 2005. Acrylic on canvas, 78.5 x 43 in. "Starburst", 2005. Acrylic on canvas, 48.5 x 96.5 in. The opportunity to comment on the work of Robert Scott has, in certain ways, forced me to focus more clearly on considerations and reconsiderations of modern abstract painting. Serious questions regarding the viability of modern abstraction have already been raised and questions of my own occur upon every viewing of new abstract paintings. In the age of Postmodernism, with its deep scepticism of modernist and other certainties, how does one approach and evaluate contemporary abstract paintings? Have the myths and realities of modern painting been undone by a re-evaluated knowledge of our illusions? These kinds of questions have also been prompted recently by my looking again at the great abstract paintings from the 1940s through the 1960s; Canadian and American as well as European. I am still astonished, as I had been earlier in life, at the sheer power and presence of the paintings of Jackson Pollock, for example, or Willem de Kooning or Jean-Paul Riopelle. In Europe, I was equally impressed by the major works of Pierre Soulages, Antoni Tapies, Bernard Shultze and Han Tier. Again, I ask myself how these paintings can remain so powerful, weathering time with their incredible presence and probity intact. How then do I approach and introduce the paintings of Robert Scott? I've always liked Scott's work precisely for its physical presence and now must ask myself why I prefer his work to a great deal of other recent abstract painting. I like his later work even more and feel that in the best paintings, Scott is proving himself as an artist of considerable strength. His paintings, like those of all serious modern painters, refer ineluctably to their own making, yet reveal, as well, an intense and intimate process of sublimation. It is in that respect that Robert Scott is essentially a romantic painter and, I believe, from this realm that his paintings gain their strength. Scott's paintings are neither timid nor half-hearted. They impose themselves physically as much as visually. They exert their objecthood through thick and lush encrustations of paint which, in their most extreme, leave two-dimensionality behind. In creating big pictures (and even his works on paper are big), Scott literally and physically creates a highly animated wall of paint. It is obvious that Robert Scott celebrates and emulates both painterliness and expression and has an affinity to painterliness in all of its past manifestations. It is equally obvious, however, that there is an important and specific connection to the final liberation of surface and the all-over painting first achieved by Pollock. It is to this brief moment in the history of painting, with its immense aftershocks, that Scott's work seems essentially tied. It seems so mundane now as to be easily dismissed, but we forget how extremely radical was the final barrier of the surface. It was like the sound barrier. Many believed (and apparently still believe) that for painting to become entirely surface, as discrete object the being of painting, without reference to another subject or space, was impossible, even though its implication had lain at the very roots of modern painting. Paul-Emil Borduas, one of Canada's most radical painters, was nervously reluctant to take this final step. Modern painting, through Pollock, had gained complete objecthood. Illusionary space, the metaphorical glue of painting since the Renaissance, had finally been eliminated. It is equally relevant that Scott's work is not connected to, nor does it rely on, the theoretical foundations formulated after 1960 by Clement Greenberg and known as Post-Painterly. In fact, his practice is described perfectly by Greenberg in his 1962 definition of painterliness as "loose, rapid handling, or the look of it; masses that blotted and fused instead of shapes that stayed distinct; large and conspicuous rhythms; broken colour; uneven saturations or densities of paint; exhibited brush, knife, or finer marks, ..."1. Greenberg's observation of the qualities and value sought after in Post-painterly abstraction clearly indicates a concentration on pure colour and openness, neither of which are principles of Scott's method. In fact, opposing a clear order of pure colour and openness (or a rational ordering of formal areas in relationship to themselves, to the edge of the canvas, etc), there is in Scott's paintings a tendency toward amalgamation, darkness, and cloistering. What appears as expansive is, at the same time, an inward movement. The heavy strata of pigment and gel are involved in a secretive and revelatory process of layering and uncovering and the recorded gestures of the artist can range from small nuances to large pictographic passages. The paintings are surfaces and, like a sea of tensions and articulation, are the testimony of Scott's practice. The paintings are never reductive nor conceptual. This seems like a large leap, but Robert Scott's paintings have never really been burdened by the grand telelogical debate that evolved around abstraction in North America and likely benefitted from not adhering to more polemical notions of paintings. Many have thought that the endless variations of an otherwise strict set of parameters that were born from this evolution eventually threatened to reduce modern abstraction to painting that was mannered and repetitive. Many believe as well that the precedents of modern painting will remain irreversible and that to smugly dismiss them is to run the risk of stepping into other ideological quicksands. Introspection is healthy for art, as is the awareness of illusions. Robert Scott is a modern painter in the most basic sense, yet his work ultimately avoids the illusions of fashion and timeliness. 1 Clement Greenberg, "After Abstract Expressionism", Art International 6, 1962, Pp. 24-32. 2 I hesitate to imply a close connection between artists whose work varies so considerably but I refer here to the bold spirit of abstraction.